(Newswire) – Signal Books is pleased to announce Right Here, Right Now: Politics and Leadership in the Age of Disruption by Stephen J. Harper, on sale October 16, 2018 in North America. Right Here, Right Now draws on Harper’s decade of experience as Canada’s 22nd Prime Minister and G-7 leader, to help readers understand the changes we are seeing in politics, business and society. Designed as a blueprint for global decision makers and leaders everywhere, Right Here, Right Now offers exclusive and highly accessible insight into the most relevant issues driving business decisions today, including: international trade, geopolitics, immigration and technology. Signal Books publisher Douglas Pepper said: “Right Here, Right Now offers a unique and clear-eyed assessment of why we are living in an unprecedented age of political, economic and social disruption. As a former G-7 leader, Canada’s 22ndPrime Minister and a trained economist, there is simply no better voice to provide a positive and practical plan for how we can move the world forward, together”. Right Here, Right Now will be available for purchase in hardcover, ebook and audiobook formats. 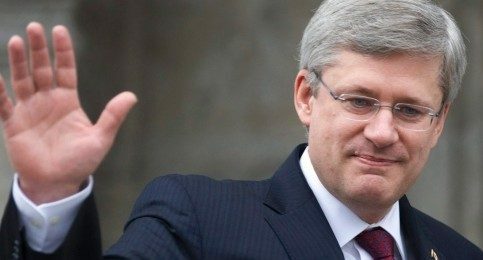 STEPHEN J. HARPER is an economist, entrepreneur, and former G-7 leader who served as Canada’s 22nd Prime Minister for nearly a decade, from February 6, 2006 to November 4, 2015. Today, he is the Chairman and CEO of Harper & Associates Consulting, a firm that helps its clients navigate global business risk. He speaks regularly to global audiences about investment trends, international trade and geopolitics. In 2018, Harper was elected Chairman of the International Democrat Union, the world’s preeminent alliance of centre-right political parties.